466 pieces of semiprecious stones hand shaped & inlaid in this beautiful art marble tray. 1. Paua Shell --------------- Colorful Shiny Stone. 2. Lapislazuli ---------- Blue Stone. 3. Carnelian --------- Orange Red Stone. 4. Turquoise --------- Sky Blue Stone. 5. Malachite -------- Green Stone. 6. Jasper --------- Brown Stone. 7. Mother of Pearl -------- White Shiny Stone. 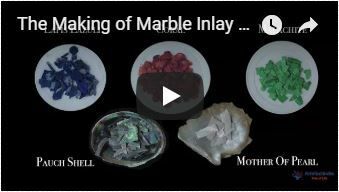 The white marble inlay tray is a finest art piece made by the artisan, you can see the details in the pictures that how beautifully the design is made with the natural semiprecious stones. It is a beautiful piece which creates a stunning color contrast on Coffee Table/Dinner Table for serving food or drinks or as a beautiful decorative piece that could display anywhere in your home(Display Stand Include). You can use it as a serving platter or a serving tray and you can also put it on your dining table, coffee table, side table etc. The unique quality of the white marble that it is translucent with the light, you can make the arrangement of the light under the tray and it will translucent with the light. The marble inlay tray is made in Agra India & fully handmade. To maintain the marble tray simply clean it with soap & water & dry cotton cloth. The White Marble Inlay Decorative Serving Tray will be delivered by Fedex or Dhl free of cost door to door. The parcel is dispatch with proper packing fully insured covering all kind of risk. To maintain the marble inlay tray simply clean it with soap, water and dry cotton cloth. It is an art piece which will be a beauty the conversation pcs at home.